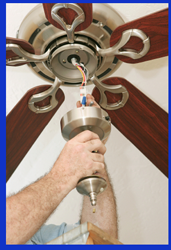 This Gilbert AZ Handyman specializes in minor home electrical repair and improvement projects. Are you living with an electrical outlet or switch that is not working properly? Are you straining to read in that dark corner of your home? I can fix a outlet or install an updated lighting fixture. Small electrical projects not only make your Arizona home a better place to live, they can improve the safety of your family and guests. Call the Gilbert Handyman at (480) 232-7689 and let’s take care of all the electrical repairs in you home. Gilbert Handyman Services for Minor Electrical Repairs Include . . .